My third Cult Black Box arrived last week with three colors, and 5 (count them 5) different dotting tools. They have different sized balls on the ends so you can make small, medium or large dots. Or as I have done, used the largest one to make a lone line of color. Here is a step by step for you. 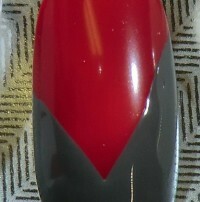 Apply base coat, then one coat of Cult’s “One and Done” lacquer in ‘El Matador’. 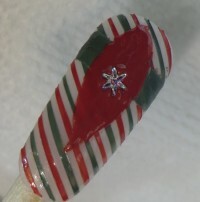 Next is to apply two diagonal strips across the nail in the color ‘Boneyards’. As you can see, the lines do not have to be perfect. These are off center for extra character! 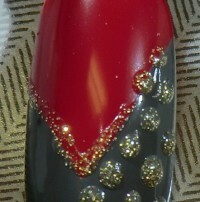 Using the largest dotting tool dipped in ‘Stay Gold’, I started at the center of the nail where the color met. I gently pulled the tool towards the side of the nail. Repeat on the other side. As you can see, it doesn’t go all the way to the end, so I used the same dotting tool and added a couple of accent dots to complete the line. 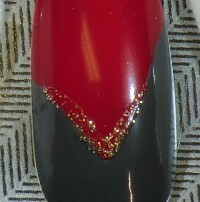 Then some accent dots on top of the free edge for some glitz! Top coat and finished. Kind of cute. I really like ‘Boneyards’. The color is almost purple tinted medium grey. I am sure I will find more uses for this one! Well, Christmas is still happening here in Las Vegas! No, actually I just received my third Black Box from Cult Cosmetics today. I think I must have signed up at the wrong time because to me the colors like very Christmas-y! Oh well, it is always fun to try new colors. And I got some fun dotting tools with this one. I received 5 of them in this months box. All different sized balls at the end to get different effects. I also like the design in the tool itself. Kind of whimsical. 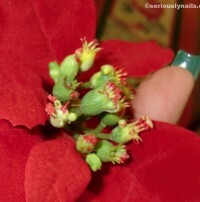 The colors, like I said look Christmas like to me, but I will see what I can do with them for more relevant nail art. The colors are “El Matador”, a creamy rich blue based red. “Stay Gold” which is a clear based glittery gold. I will use a thick coat to get solid coverage. “Boneyards” is a deep satin medium grey that I love! I will use this one a lot! 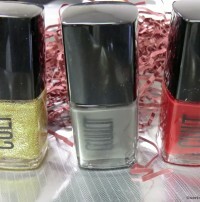 The lacquer as pictured are Stay Gold, Boneyards, and El Matador! The kit also includes techniques for doing different art with the dotting tools! I will whip something up for you folks asap. I know it sounds weird! Who would want green nails???? EVER? Yuk right! No not really. Not when it is just lacquer! I was doing some nail art for a submission that I am working on for the new year (St. Patrick’s day) and I thought I could take a detour and do a little Christmas art to see if I like the colors for the holidays. You may notice the change in my nails shape. I am not sure what this is called but I have seen it recently in magazines/on line ect. Usually with a more dramatic edge to them. I am liking the shape of them. It is out of the norm for me but I like them. My shape gives a nod to a fellow nail enthusiats and co-worker from my OPI days. 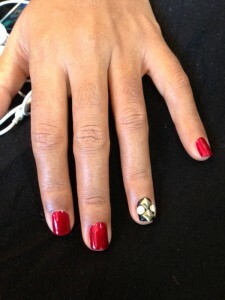 Doni Horne has worn her nails “scooped” like this since I met her. She was way ahead of her time. Thanks for the softer version Doni! The ones I have seen in magazines/on line are generally straight and pointed dramatically at the end. So the colors I used were “Ruynon” from Cult Cosmetics for the base. “This is Tree-mendous” by China Glaze on the statement finger over Ruynon. I used a sparkly gold striping paint with a stripping brush to make the star. 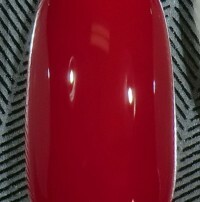 And to kick it up a notch, I used “Don’t mess with OPI” under my nails to give them a darker Christmas surprise! So, last week I received my second “Black Box” from Cult Cosmetics. The colors were definately fall colors but they didn’t strike me as Christmas-y! I will be honest and tell you that I got the inspiration for this Christmas nail art from a Christmas card that was sent to us. I was very surprised by how well the colors worked in the holiday theme. Step 1. 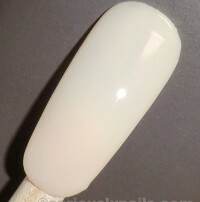 Apply two coats of OPI’s “Bubble Bath” for the base. Step 2. 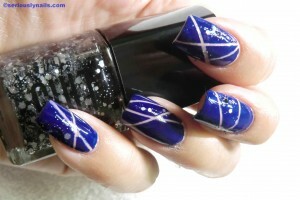 Line the nail with nail art stripping tape. Step 3. Using a small thin art brush paint alternate areas with Cults “Rose Bowl”. Step 4. 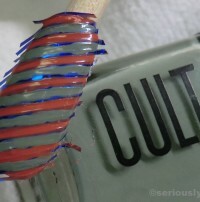 Paint alternating areas with Cult’s “Runyon”. Allow to dry completely. Step 5. 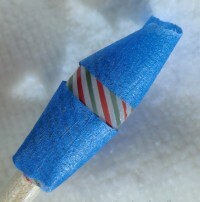 Remove tape from nail. Step 6. 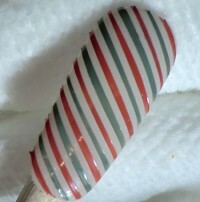 Apply painters tape to the bottom portion of the nail to mark off area where a large stripe of green will be. Step 7. Apply “Runyon” to that area. Step 8. 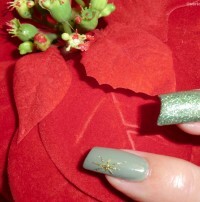 Once the green has dried, use “Rose Bowl” and a small pointed nail art brush to form a tear drop shape to the nail. While that is still sticky apply any type of sparkly nail jewels. Step 9. I added some green stones to accent the green in the nail polish. Finish with top coat and let dry! I really liked it with just the stripping on it as well. And I suppose that I could have used some green stripping tape for the ‘string that holds the ornament’. But, hey, that’s what makes nail art fun. You can play and play and play. I hope you are enjoying all the Christmas art that I have been posting. I’m kinda addicted to it right now! It’s making me very excited for Christmas. 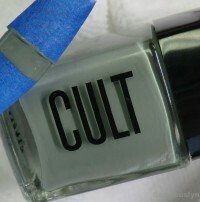 For those who follow me regularly, you know that I signed up to Cult Cosmetics “Black Box”. 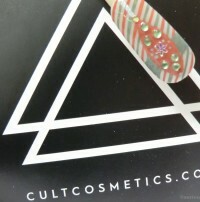 For those who don’t know about it, Cult Cosmetics has a monthly subscription service where they mail you a box full of new nail goodies each month. Total cost is only $24.95 a month and you can get some fun colors. 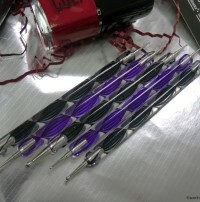 Plus it comes with nail art tools of some kind and a tutorial. This month I received my box and wanted to share with you the colors. First of all, they do a nice job of packaging everything so it is nice and tight in the box. But they also make it pretty for when you are ready to play with it. This box came with 3 “One & Done” Cult nail lacquers and a bottle of black nail art lacquer featuring a small long brush for striping! Cult Color #2 is a light burned pumpkin called “Rose Bowl” I guess they feel it looks more rosey than orangie. Might be different on. Stay tuned for that post. Cult Color # 3 is a deep dark chocolate brown called “Mulholland”. 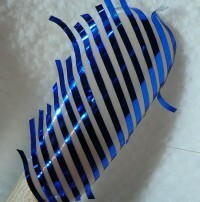 Then the stripping brush lacquer is by Color Club Art Color. 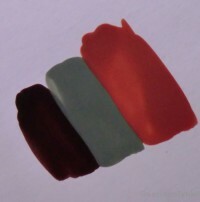 I will play with these colors for some nail art. They don’t really feel like traditional holiday colors that I had expected (not necessarily a bad thing) but I will try and find some holiday nail art to show them off. I had so much fun with the Cult Cosmetics Black Box I received that I thought I would keep it going. 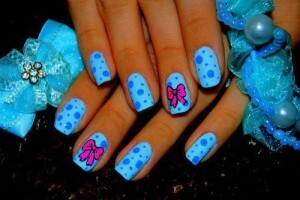 In the recent past, there has been a nail art trend where the artist has one nail with completely different nail art. Either the color is different or it has art on it. Or maybe it has complete bling while the others are left with just lacquer on. 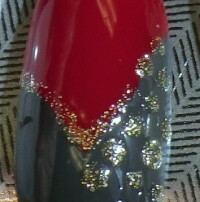 Some will have a sparkly nail for the accent on the statement nail. Then some will have some will have a pretty design. There is no right or wrong way to enjoy statement nails. They are simply a “Statement of your Style”! Which I LOVE! So keeping with the theme I had going with my reversed stripped nails, I simply kept one nail painted with “Joshua Tree” from Cult Cosmetics, added some stipping, and then added some accent stones in a pretty blue! I sealed all this with a good top coat to keep the stripping from peeling off and so the stone would stay in place! The pinky finger you see here started with ‘one and done’ “Joshua Tree”, when that was dry, I applied stripping tape, then a coat of the ‘one and done’ “Point Dume”. Once that was very very dry, I peeled off the stripping tape. Voila!!! !